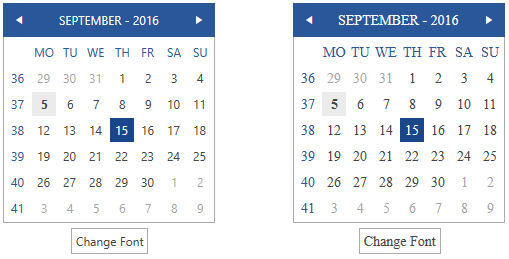 The official R3 2016 release of UI for WPF includes a brand new Office2016 theme. Below you can find more details about each brush and where it is usually applied. MainBrush: This brush is white by default and it is mainly used as background of the controls. MarkerBrush: This brush is dark by default and it is used as foregound color. MarkerInvertedBrush: This brush is a light color by default and it is mostly used as foreground color while you interact with the control. If the control has accent interaction states, we apply the brush for better contrast. The Office2016 palette provides both accent and non-accent brushes for the different interaction states. The accent brushes are by default deep blue brushes and are used to highlight input and interaction elements - e.g. buttons. AccentBrush: This is the main accent brush and it is used mainly for headers and interaction feedback. AccentMouseOverBrush: This brush is brighter shade of blue and it is used for controls in accent-colored mouse over state. AccentPressedBrush: This is the darkest shade of blue and it is used for controls in accent-colored pressed state. The non-accent brushes are different shades of grey by default and are used for interaction feedback in secondary input or navigation elements and other components which do not need accenting – e.g. RadListBox, buttons in RadRibbonView. MouseOverBrush: This is the non-accent brush for the background of the control while in mouse over state. PressedBrush: This is the non-accent brush for the background of the control while in pressed state. SelectedBrush: This is the non-accent brush for the background of the control while in selected state. AccentFocusedBrush: This brush is light blue and it's the default brush for the focused visual and rarely for any other interaction. ValidatonBrush: This brush is red by default and it is used for failed validation where such is applicable in our controls. There are several brushes used as background color other than the MainBrush. PrimaryBrush: This brush is used as a background of the input controls in disabled state. AlternativeBrush: This brush is used as an alternative background – i.e. for popups or if we want to distinguish one element from another and for more complex controls – RadRichTextBox, RadImageEditor, RadTabControlItem. ComplementaryBrush: This is used for background of components in more complex controls or their states. For example in RadOutlookBar, RadPanelBar, RadTreeView. ReadOnlyBackgroundBrush: This brush is white by default and it is used as a background brush of the controls while in read-only state. ReadOnlyBorderBrush: This brush is light gray by default and it is used as a border brush of the controls while in read-only state. BasicBrush: This brush is grey and it is used as the default border brush of the controls while in normal state. IconBrush: This brush is black by default and it is used for glyphs and paths. When using the Office2016 theme you can dynamically change the FontSize and FontFamily properties of all components in the application the same way as you do in Windows8, Windows8Touch, Office2013, VisualStudio2013, and Green themes. Example 1 shows the default font sizes and families. The Examples 2 and 3 shows how to change the default FontFamily from "Segoe UI" to "Times New Roman" and the FontSize from 12 to 14 on a click of a button. With Office2016 theme we are introducing a new approach to add icons and icon-like images. Instead of images or paths we are using a font of glyphs by default. The TelerikWebUI font provides over 400 scalable vector glyphs that are available for use to our clients. We have chosen this approach because it provides a number of advantages and benefits. They are available for use in any of our themes, when the needed resources are included. They are not specific for the Office2016 theme. Since each glyph’s string value is ambiguous and not related to its shape, we are providing a resource dictionary with key-value pairs for easier usage and referencing in projects. It also provides compatibility for future inclusions of new glyphs as it is updated to any shifts in the string values of the existing glyphs with no need to change the references in the projects. You can read more about the usage of the new glyph's feature and see the available glyphs in this article. A new feature of the Office2016 theme’s palette is the FocusThickness property. It defines the thickness of the buttons’ focus border. 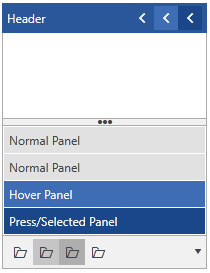 As our design is inspired by the Microsoft Office, the focus border of the buttons is thicker than the one of the other controls and elements. By default the FocusThickness is set to 2, but it is easily changeable in a similar way to the other palette properties. The Office2016 theme exposes an easy way to modify the corner radius of many elements in your application. You can use the corner radius properties of the palette. By default all radius values are 0. Example 8 shows how to change the default corner radius from 0 to 2. You can now easily change the read-only background and border brush of all text input controls (Syste.Windows.TextBox, RadDateTimePicker, RadMaskedInput and RadWatermarkTextBox) using the ReadOnlyBackgroundColor and ReadOnlyBorderColor properties of Office2016Palette. If you need to change the opacity of disabled elements, you can easily do it via the DisabledOpacity property of Office2016Palette. The default value of the property is 0.5.